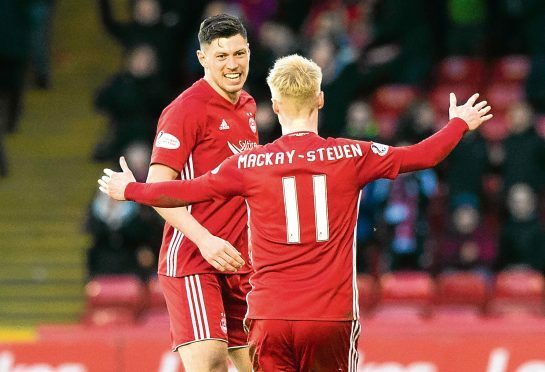 Scott McKenna and Gary Mackay-Steven. Aberdeen manager Derek McInnes is content with the depth of his squad for the second half of the season, despite failing to land a deadline day signing. There were three departures from Pittodrie before the transfer window closed as Mark Reynolds, Bruce Anderson and Scott Wright exited on loan to Dundee United, Dunfermline and Dundee respectively. But there were no new arrivals with the Dons missing out on loan deals for Celtic duo Lewis Morgan, who went to Sunderland, and Jonny Hayes, who remained at Parkhead. That meant the return of Max Lowe from Derby and Greg Stewart from Birmingham on loan deals were the only new additions during January, while midfielders Greg Tansey and Chris Forrester were released earlier in the month. But McInnes drew positives from retaining Scott McKenna and Gary Mackay-Steven, who were the subject of bids from Stoke City and New York City. McInnes said: “I totally get that with the excitement of deadline day and fans all on their phones or watching Sky waiting for a signing but the reality was the budget was spent. “There are times when you look at what you would like and every manager would like to add someone even if they are pleased with what they’ve got. “There’s always the thought that maybe one more would be nice and every window is the same with fans thinking we maybe should have done better. “Especially in January but the board should be applauded for keeping Gary and Scott at the club and although the numbers are tighter we have a strong squad to meet the challenge ahead. “If we had signed Greg Stewart on deadline day and not two weeks ago it would have been that exciting signing but we are delighted to get him and he will repay that faith. “Based on what we’ve got and the emergence of some of the younger ones then we have a squad that in terms of numbers will be absolutely fine. “At the start of January we didn’t have Greg and Max Lowe had returned to Derby but we managed to get both of them in and I’m delighted with that. McInnes, meanwhile, said he expects captain Graeme Shinnie, who is out of contract at the end of the season, to provide some clarity over his likelihood of signing a new deal. The Dons travel to Edinburgh to meet Hibernian this afternoon and McInnes admitted he was disappointed to see Neil Lennon depart the Easter Road side earlier this week. He said: “You are never totally surprised in football but I’m disappointed as Neil was brilliant for Hibs and it looked a good fit.